Travelling to Australia? When it comes to driving through this stunning country, you will encounter many different road signs that you may not be aware of. From humorous signs to enforced laws, it’s essential to familiarise yourself with road rules and signs to ensure your Aussie road trips runs smoothly. From the dreamy Great Ocean Road to Adelaide to Ayers Rock and even Brisbane to Cairns, keep this infographic nearby. You will spot countless signs in Australia. The great thing is that they are easy to understand. They will clearly mark the intended meaning to ensure you won't be confused. Signs with animals: This means that the image of the animal pictured can be found in the area. Make sure to show caution when driving when you see these signs as these animals may be on the road or nearby. Warning signs: If a sign says danger, beware or warning, this means you need be cautious when in these areas. You'll see why this is the case as it will be stated clearly on the sign. Yes, these signs actually exist in Australia! 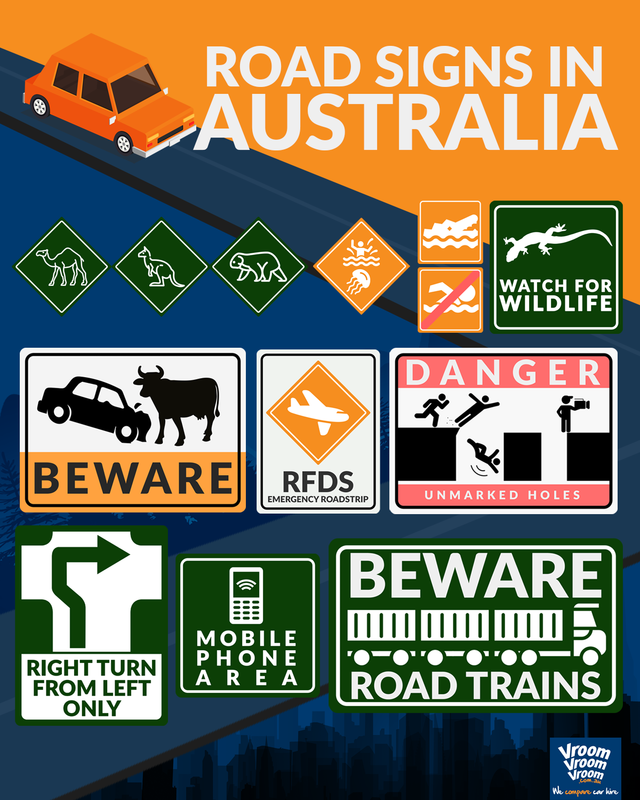 From our range of wildlife to our vast roads that lack reception, keep an eye out for these signs when you visit the land down under.